If you’re anything like me, you might have still found scraps of Christmas lying around when you were getting ready to help your children with a school Valentine’s Day celebration. It’s still cold in most parts of the country, and we might still feel a bit of a holiday hangover when we’re not quite sure what to do with ourselves in the days following the Feast of the Epiphany. What is going on with Ash Wednesday? Do we have enough King Cake? And the Feast of the Annunciation just shows up like the angel Gabriel, ready to disrupt our Easter Bunny browsing reverie at Pier One. We just got the Christmas tunes out of our heads, and now we’re humming again, “Most Highly Favored Lady … Gloooooooria.” This is the Feast when we remember and celebrate Gabriel’s announcement to Mary that she would be the mother of Jesus. It must have felt very disruptive. Babies can do that to us. When I became pregnant with our oldest child, I had experienced a series of miscarriages in the previous months, and my husband and I had just moved cross-country to Minnesota from Virginia. I was in a car accident and our beloved dog was diagnosed with an autoimmune disorder. Our lives felt a little bit upside-down. As a distraction from our topsy-turvy lives, we went to a live performance of A Prairie Home Companion, which seemed like a very Minnesota thing to do. Throughout the first act of the performance, I could have sworn that everyone in the audience, but especially the guy sitting next to me, had bathed in beer before they arrived. The whole venue smelled like a brewery to me. During the intermission, my husband found a mostly-empty beer can under my seat and disposed of it in the lobby, and with it, the beer smell disappeared. Our second child was a bit more of a tease. The blood tests that my doctor ordered to confirm my pregnancy with him were not showing the predicted results, which shows that you really can (despite the anecdote) be “a little bit pregnant.” He came into the world with great drama – water breaking, cord wrapped around his neck twice, and weighing in at nine pounds, nine ounces. He followed that up by treating the whole family to a few months of colic. 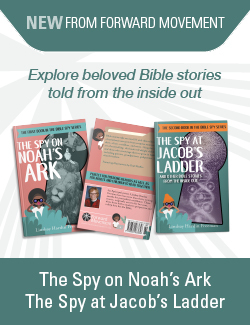 When strangers commented on his big, beautiful eyes, his older brother would tell them, “It’s because he’s nocturnal.” I really only felt “highly favored” when he learned to sleep through the night. YouTube is full of pregnancy announcements that are more glamorous than my beer can story or my wonky blood test results, and less exotic than an angel’s announcement. At some point, all of us were announced to our own mothers in some way. Even when that announcement is expected, even anticipated, it can be surprising and jarring to the person receiving it. 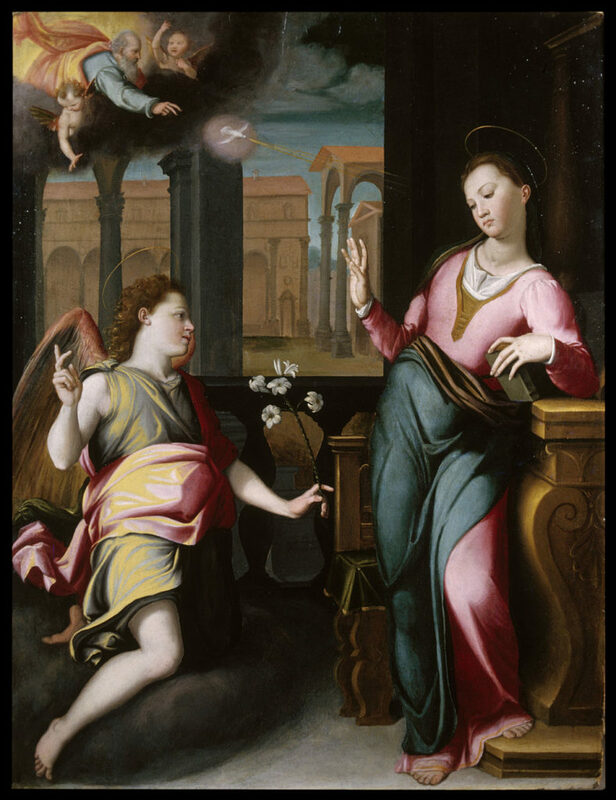 The Annunciation by Santi di Tito property of the Public Domain via Wikimedia Commons. When we remember the Feast of the Annunciation, we think about how jarring it must have been to Mary. We also remember that Christmas feels like a long time from now, reminding us that Mary lived with the news of Jesus in her heart – and in her body – for a long time. Anybody who has waited for a baby, either through pregnancy or adoption, can tell you how long nine months can feel. The uncertainty in Mary’s future must have made everything feel a bit more heavy. The Annunciation was just the beginning of the very real journey that she accepted to bring God’s son into the world. As Christians, we celebrate with Mary the surprising and disrupting news that Gabriel gave to her. We honor her as the highly favored one who received this news with grace. And we give thanks to her for bringing God’s son into this world to save us all. Awesome, beautiful, and incredible! Thanks, Carrie!